Small business owners are notoriously busy, often juggling multiple tasks at once, making it difficult to stay on top of everything without unnecessary stress. 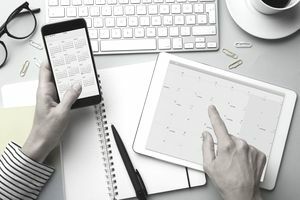 Luckily, there are many digital tools out there that can help even the busiest small business owners get on top of their schedules and make the most of the time they have. This list of tools covers just about every area of business where you may need a little extra support. Don't worry; you don't need all the tools to improve your business processes. Just start by picking one from each category that tops your list of challenges. One of the ongoing goals of most small business owners is to get more done in less time. It is why the productivity tools below are useful for every small business owner. Evernote - A productivity app to manage projects, ideas, lists, and inspiration across all of your digital devices. Asana - A web and mobile app that helps teams manage and track their work. Trello - A productivity tool that uses boards, lists, and cards for organizing and prioritizing. Slack - A real-time messaging and collaboration tool for teams. Basecamp - A project management and collaboration tool to manage to-dos, files, messages, schedules, and milestones. 17hats - An all-in-one business management tool that helps you stay up-to-date with work from anywhere. IFTTT - A tool that connects the apps and devices you love with “if this, then that” statements. OmniFocus - A cross-device app designed to quickly capture, store, manage and process your thoughts and ideas into actionable to do's. If you travel for business, there are a handful of apps that can make your trips more productive and enjoyable. Streamline your travel with the tools listed below. Expensify - A travel and expense app for tracking both personal and business expenses. Gas Buddy - An app that lets you search for gas prices by city, state and zip code. MileIQ - An automatic mileage tracker that logs your business miles. TripIt - Organize, plan and manage your travel plans in one place. TripAdvisor - Access 200 million+ unbiased traveler reviews before you book your trip. Uber - Download the app and get a ride to your next meeting in minutes. Managing your social accounts can wipe out a lot of your time if you don't do it wisely. The tools below will help you spend less time managing social media while increasing your impact. Hootsuite - A platform for managing multiple social networks and keeping a pulse on your brand's reputation. Buffer - A tool to drive traffic, increase fan engagement and save time on social media. Sprout Social - A social media management tool created to help businesses grow their social media presence. TweetDeck - A Twitter management tool for real-time tracking, organizing, and engagement. Most small businesses can benefit from a blog and content marketing strategy. Consider the tools below to be must-haves for getting started with blogging. WordPress - The largest self-hosted blog content management system with tens of millions of users. Google Analytics - A tool to measure advertising ROI from your online marketing efforts. Kissmetrics - A platform that helps you track, analyze and optimize your digital marketing. SEMrush - A competitive intelligence suite for online marketing, from SEO and PPC to social media and video advertising research. HubSpot - An inbound marketing and sales platform that helps companies attract visitors, convert leads and close customers. Kapost - A B2B marketing tool that delivers compelling and consistent content from first touch through sale to advocacy. Optimizely - A platform for businesses to conduct A/B testing on their web properties. If you have a service-oriented business that requires appointments scheduled ahead of time, give your clients a way to book their next appointment online with one of the tools below. Appointy - All-in-one online scheduling software used by more than 65,000 customers worldwide. Schedulicity - A mobile platform for service professionals that includes online scheduling, client management, email marketing, and other business tools. Genbook - A tool for appointment scheduling and managing your business, staff, and customers. Whether you have a graphic designer on your team or you are more of a DIY designer, the tools listed below cover varying levels of experience and function. Adobe Creative Cloud - Adobe's entire collection of creative desktop and mobile design tools. Visual.ly - A tool to create content that is eye-catching and engaging. Pixlr - A free online image editor that allows you to fix, adjust and filter images in a browser. iStockPhoto - A stock photography site with millions of royalty-free images, illustrations, and videos. Gimp - A free and open-source graphics editor image retouching and editing, resizing, cropping and more. Skitch - A screenshot tool that allows you to add annotations, shapes, sketches and more. Customer service can make or break a business. Make your customer service process more efficient while building customer loyalty with the tools below. Zendesk - Web-based help desk software used by more than 75,000 organizations worldwide. Get Satisfaction - A customer engagement platform that helps companies build better relationships with their customers and prospects. Freshdesk - Cloud-based customer support software that lets you support customers through many different channels. LivePerson - A messaging platform that drives online conversions and customer loyalty. Kayako - A unified customer service platform that helps you build better relationships with your customers. BoldChat - Customizable live chat software for desktop and mobile websites. Help Scout - Live chat software that has many features designed for improved customer service. SurveyMonkey - Create and publish online surveys to find out what your customers want. When it comes to keeping in contact with your customers, email marketing is the best way to communicate and build customer loyalty. The email marketing platforms below will increase your brand recognition and credibility with customers and prospective customers. MailChimp - Online email marketing solution to manage subscribers, send emails and track results. Constant Contact - A tool that empowers small businesses to grow and succeed through email marketing. VerticalResponse - A platform to send email newsletters, offers, invitations and autoresponders to grow your business. AWeber - A suite of email marketing tools geared toward small businesses. InfusionSoft - A way to automate your small business marketing, CRM, email marketing, lead capture and e-commerce in one place. iContact - Create, send, and track your newsletters with this email marketing platform. Emma - Email marketing solution with features that help you segment and communicate with your customers. Mad Mimi - A simple tool to send HTML email newsletters, grow your subscribers and manage your email list. Get Response - Create email campaigns, then use statistics to improve your business in your customers' eyes. There are so many tools small business owners can use to keep track of their budgets, invoice customers and take payments online. Explore the accounting and bookkeeping tools below to get started. FreshBooks - Invoicing software for small businesses to easily send invoices, track time, manage expenses and get paid online. Quickbooks Online - Use your iPad, mobile phone or computer to do invoicing, billing, run reports or pay employees online. Xero - Accounting software to manage invoicing, bank reconciliation, bookkeeping and more. Wave - A tool for small businesses to manage invoices, credit card payments, accounting, and payroll. FreeAgent - Online accounting software brings together invoices, expenses, payroll, and tax return filing. Invoicera - An online invoicing tool that allows users to monitor, dispatch and accept invoices in one web service. LessAccounting - Small business bookkeeping with simple and easy-to-use features. Effective communication is vital for every small business, whether it's with customers, employees or other members of your team. The tools below allow you to communicate, chat and talk face-to-face with the most important people in your business. Skype - Initiate video calls, group video calls and instant messages with your business contacts. Google Hangouts - Conduct group video calls with contacts across computers, Android and Apple devices. RingCentral - Cloud-based global communications that allow your small business to be productive from anywhere. GoToMeeting - HD video conferencing in a simple yet powerful way to collaborate in real time. WebEx - A tool that provides on-demand collaboration, online meeting, web conferencing, and video conferencing. Campfire - Team collaboration with real-time chat, plus the ability to share text and files instantly. Yammer - A freemium enterprise social networking service used for private communication within organizations. Join.me - Collaborate instantly with free screen sharing, unlimited audio, and simple video conferencing. How you manage your customer information can set the stage for your entire lead generation process. The tools below will help you create and manage your pipeline. Insightly - Cloud-based customer relationship management and project management tools for small businesses. Salesforce - Build more meaningful relationships and connect with your customers across sales, customer service, marketing, communities, and analytics. Zoho CRM - Bring all of your conversations into one place across email, social media and in person. Pipedrive - Sales pipeline software that gets your team organized. Act! - Organize all your prospect and customer details in one place so you can market your products and services more effectively. Batchbook - A small business CRM solution that helps you build meaningful relationships with customers. Do you use your website to make money in your small business? Use the tools below to sell your products on your website and get paid online quickly and easily. PayPal - A way to send money, make online payments, receive money or create a merchant account. Shopify - Ecommerce software that helps you sell online and in person. BigCommerce - An all-in-one e-commerce platform with the power to grow your business and help you sell more. Volusion - Ecommerce software to create an online presence and e-commerce store. Gumroad - An all-in-one online selling solution created specifically for creative projects. WooCommerce - A customizable eCommerce platform for building your online business. Email can get quickly out of control, hurting your productivity. The email management tools below will help you stay on top of your email and make it a productive tool, not a time-wasting tool. Rapportive - A Gmail tool that shows you everything about your contacts right inside your inbox. Boomerang for Gmail - Snooze Gmail emails for later without leaving your browser or Gmail. SaneBox - Automatic email filtering, one-click unsubscribe, email reminders and more tools to manage email. Aqua Mail - An email management app for personal and corporate email for Android devices. Spark - A smart email client that solves a problem of an overwhelmed inbox. Being able to share your files quickly with your team, while collaborating and tracking changes, is a powerful way to boost productivity. These tools are excellent options for file sharing. Google Docs/Google Drive - Edit and share documents on Google Docs, then store then on Google Drive for easy access. Box - Online file sharing and content management service for small businesses. Dropbox - A tool to keep your files safe, synced and easy to share. Carbonite - An online backup service, available to Windows and Mac users, that backs up documents, e-mails, music, photos, and settings. SugarSync - A cloud file sharing, file sync and online backup service that is simple, powerful and easy to use. Hightail - Formerly YouSendIt; Hightail is a cloud service that lets users send, receive, digitally sign and synchronize files. Microsoft OneDrive - A tool to access and share your files from anywhere, on any device. Business networking can help you grow your customer base while providing opportunities for learning, development, and growth. The tools below will help you network more effectively from the office and on the go. LinkedIn - A networking tool to find connections to recommended job candidates, industry experts, and business partners. CamCard - A way to capture business cards, and all the contact information on them, right on your smartphone. WhosHere - An app that lets you find and chat with people nearby, across town or around the world. MeetUp - Find Meetups and meet people in your local community who share your business interests. Without goals, your business won't be able to grow. Goal setting, when done consistently, can help you reach new levels of success in your business. Try one of the tools below to set and track your business goals more effectively. Joe's Goals - A simple yet powerful tool to make tracking your goals the easiest part of accomplishing them. Goal-Buddy - An online goal setting software that gives you all necessary tools to set, track and achieve your business goals. GoalsOnTrack - A smart goal setting software program that helps you set track and share goals, manage tasks and track time. GoalEnforcer - Visual goal setting software to help you set goals, plan faster and accomplish more. Lifetick - Web-based software that helps you set track and achieve your goals in life. Strides - A tool that helps you track all of your goals and habits in one place. There Is a Downside to Cloud Computing for Business — but What Is It?